According to Forrester, 72% of customers prefer to self-serve to answer their questions. Christophe Capel will demonstrate how Atlassian’s IT team built a self-service desk for its legal team to maximize its efficiency and add more value to the business. Atlassian’s self-service desk enabled it to cope with a two-fold increase in service requests by automating business processes and workflows, creating a self-service catalog to reduce the team’s workload, and prioritizing high-impact requests and issues. Most people start off to work each day with some simple goals/objectives and the best of intentions. Unfortunately, days are long and lots of stuff goes other than how it was planned. When things don't go the way your customer wants them to, even if you've met all your explicit agreements, you're still at risk!. It's times like these where customers will judge you and start making decisions that will affect and your organization -- for better or worse. Handling it "the way we've always done it" and blowing a customer expectation is the organizational equivalent of painting a large bulls-eye on your back. Next thing you know, you're out of the game for good! The worst part is that many never see it coming. In this session, I will lay out some of the major areas where service providers are most likely to sabotage themselves and discuss ways to address them before they become a problem. In an ever changing market space businesses are given a seemingly unlimited choice of solutions to help them achieve their outcomes. Long gone are the days where the IT department is the only real choice. In this presentation I will speak to how new options can be managed and where IT is able to play a role enabling business success. This presentation explores the recent evolution of multidisciplinary approaches. We've seen Agile being used to develop new software releases better, quicker and cheaper than before by involving the business in iterative and incremental development activities. This often resulted in a backlog of potentially shippable releases waiting for the high-procedure IT Ops department to get around to deploying them. So folk used DevOps to get the deployment process sorted out by working on highly-automated continuous integration and deployment. Great! We've got the functionality into production! But wait - where's the value? Amazing as it seems after this Agile and DevOps revolution, no business benefits have been realized. Value is only actually realized when the users use their information systems effectively and efficiently. Organization lose on average 7.6% productivity due to IT issues and almost half of this is caused by poor use. Take a moment to reflect on your own business users. Most of the service catalogues I've seen are technical focused. Even the clear defined offer of Salesforce.com is more or less technical and feature focused. Of course, they have a very clear structure and transparent pricing. These are two very important facts to get a service catalogue customers will like. Nervous about your future? Suddenly hearing a lot about 'ShadowIT'? That term isn't new but it's usage has exploded in recent months. What's it all about? Why should corporate I.T. care? More importantly - WHAT SHOULD I.T. DO about Shadow IT?... Anything? Nothing? In this session, Ian Aitchison describes how corporate IT departments can understand, measure and manage Shadow IT, and potentially turn the whole conundrum into a massive win win for everyone involved. A new organization has been founded that leverages professional development and networking in the area of IT Asset Management. Join us at this presentation and learn how to get involved! Buzz word for today is 'Do It Yourself', yet we find self service solutions not very well adopted in organizations. Today organizations are making huge investments on service desk and technical resources to ensure timely fulfillment.All of this affects end user experience. My session will reveal the beauty and benefits of an integrated & automated service fulfillment solution which is definitely one of the key aspects of *"Tomorrow's" *service management implementations. We go through waves of “experts” telling us that the service desk is dead and organisations are moving on, or that BYOD is removing the need for the service desk. I will be putting forward a more pragmatic response to that, including (spoiler alert) some tips to make your service desk work better for your organisation. One of the things ITIL V3 improves is the whole development/production interface, introducing radical concepts like production readiness, acceptance, evaluation... oh and testing. Heady stuff. But something that was omitted from ITIL V3 was documentation of Dead Cat Syndrome: chucking new services across the Production fence like a dead cat. Operational readiness of new and improved services ensures a smooth transition from Project to Production. 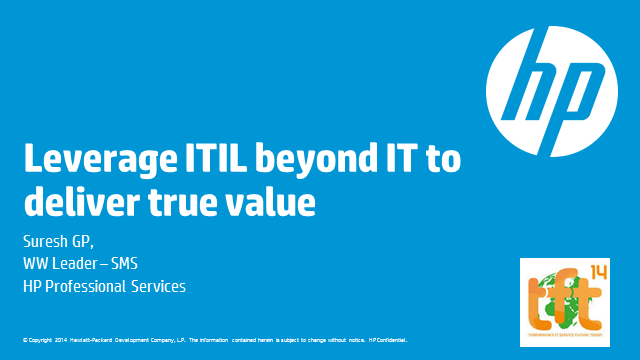 ITIL talks about it in a number of places, but I think Operational Readiness needs to be recognised as a practice in its own right, like any other ITIL "process". OR is not (just) about being a gatekeeper to Prod: it's about ensuring readiness throughout the lifecycle. OR provides a positive benefit for the customers, projects, development, and operations, preventing Dead Cat Syndrome. This presentation has been well received every time. For TFT14 I'll be updating it, with new material on warranty periods (what ITIL hilariously calls Early Life Support). Many organisations approach ITSM tool selection like a game of Monopoly. This is evident by the number of organisations that replace a technology within 2-3 years of purchase. How many times are they going to keep passing 'GO', only to find that each time they do, they end up in jail with no 'Get out of Jail free' card? In IT, we want our data straight and precise. But what if the question we're trying to answer isn't so black & white? What if the intended recipient has a pre-existing assumption about the required decision? We've grown up in a world with "up" and "down". Teachers at the top, and students at the bottom of class. Freshman (or "noobs") at the front, and Seniors ("experts") at the back. Certifications, Diplomas, Degrees at the 'end' of a course of study. Even the word "course" suggests direction, plan, timeframe. But now learning is moving faster than light and directions, beginnings and ends are becoming meaningless. Join me for some conversation about what this will mean for us, for the people we hire and work with or for - and how to create our own focus and be the caption of our own learning journey. It's Monday and you are on the elevator with some key figures in the business. Initially there is uncomfortable silence which is backed by a Muzak version of AC/DC's TNT. About half way up one of them says to the other "I have been having challenges with one of our core applications; it just doesn't deliver like IT said it would". The other replies "I know right, what the hell does IT do?" There are many ways to use social media, and most of them are lousy. Join me as we examine why Homo Hermitus and Homo Multitaskus are headed for extinction. What traits can help you join the rise of Homo Socialus? The evolution of technology has far outpaced our cultural mindset. Many people in modern, tech-prevalent cultures are choking on the detritus of busyness and abundance, while many more still struggle with basic needs. Too often technology exacerbates or obscures this problem instead of helping us solve it, because our models of value are outdated, incomplete and transparent. The challenge of today is not finding information, it is making sense of it and determining if it is relevant or not. All of our efforts of categorizing and structuring data maybe as problematic as the amount of data itself. Let's talk about knowledge assessment rather than knowledge management. "The community has spoken - your platform is ready"
TFT is the world’s first 24-hour, global, follow-the-sun virtual ITSM conference. Speakers are selected by their peers and elevated to a global stage overnight. All content is accessible on multiple channels without registration. TFT unites knowledge workers turning them into a global network of influencers, organizations and consumers.